Today on this packed WEDNESDAY Bucky & Sully Show we were and ALL around the sports landscape in our “Headlines” and our daily segments, keeping you as up to date as needed! We also talked the Bills resigning Lorenzo Alexander to a one year deal and what this means moving forward for them. Discussion ensued about the special teams and coordinator moves the Bills have made in the past few days to shore up their staff. In the second hour we were joined by Daniel Austin of the Calgary Sun. He came by to talk Flames/Sabres tonight in Calgary and what we should expect moving forward, from his point of view, here in Buffalo for the team. He pointed out and broke down several key matchups for tonights game and it was fantastic! Finally in the third hour we lapped back around the NFL and the 2 Conference Championship games scheduled for this Sunday! The guys break down as much as we could get to and even got some sound from the four teams! We also touched on the local college hoops teams as we saw the DOMINANT UB Mens Basetball Bulls take down Western Michigan last night. Obviously at the top of our second hour we got a very assertive Bucky featured in his daily spot BUCK UP! Then, in our third hour, to kick it off, Jerry was extra-super salty in his SALTY SULLY! Our THERMOSTATS were peppered throughout the show and we satisfied the waiting ears with some very tantalizing stats regarding what the guys feel are OUT OF THIS (SPORTS) WORLD! Back TOMORROW at 9! We also heard, as we do every day, the guys SHOUTOUTS and acknowledgments to some great sports stories. _ALSO AVAILABLE ON APPLE PODCASTS! | TUNEINRADIO! HOUR 1:We got into some discussion about the Bills coaching moves as well as resigning Lorenzo to a one year deal! We also talked some local hoops early on. We closed out the hour with ThermoSTATS. HOUR 2: BUCK UP! Did infact take place! Danny Austin of the Calgary Sun came by to preview the Sabres game. 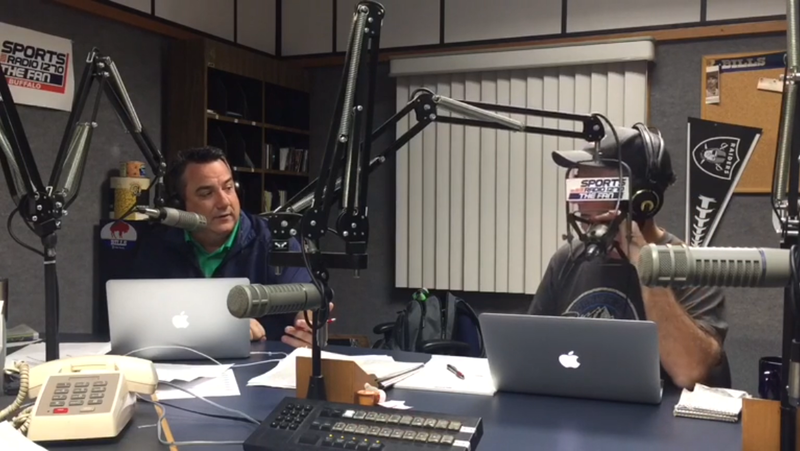 The guys talked more Sabres and Bills and caught everyone up in sports.